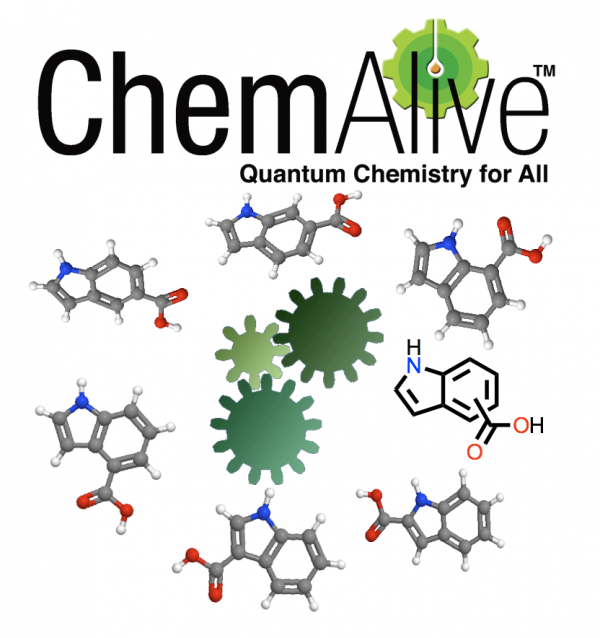 Founded in December 2014, ChemAlive (www.chemalive.com) has already gained contract business with customers such as Biosynth in Switzerland and internationally with Saudi Aramco (Aramco Services Center) to validate quantum chemistry in an industrial setting and guide the design of specific on-line tools to be launched as a software as a service (SaaS) in the third quarter of 2018. ChemAlive has also won the support of influential start-up accelerators, taking away the Gold Award, for example, from the MassChallenge Accelerator. The technology that we’ll be developing represents a sea change in scalability for us. Together, we’ll actually be able to position quantum chemistry in a totally new way. — Peter Jarowski, chief executive officer of ChemAlive. Innosuisse has awarded ChemAlive, a Lausanne-based theoretical chemistry start-up, and two NCCR MARVEL partners a significant grant to apply and commercialize machine learning and big data approaches to real-time chemical modelling based on state-of-the-art quantum chemistry. The funding will allow ChemAlive—with the help of NCCR MARVEL partners led by Nicola Marzari at EPFL and Anatole von Lilienfeld at the University of Basel—to broaden its focus from automating quantum chemistry online to positioning it in a more novel way through more powerful datascience techniques making it faster and dead simple to use. Innosuisse is contributing around CHF330’000, adding an equal share to funding being provided by ChemAlive, bringing the total value of the project to CHF750’000. The partners hope to address a major problem now facing experimental chemists: because the theoretical work can take so long, it’s often easier to just buy a material and try a reaction or process, find out it doesn’t work and then put it on the shelf and never think about it again. That is, by the time the theoretical work is done, the researcher already knows that it doesn’t work. The idea behind the new approach is to make the accurate modelling of properties and reactions fast enough that it can be used in tandem with experimental work. This should allow customers to identify successful candidate molecules with greater precision and speed up the time-to-market. Each of the three partners will play a critical role in the project. The speed will come from supervised machine learning approaches developed by von Lilienfeld’s group at the Institute of Physical Chemistry at the University of Basel. The technique involves applying machine-learning corrections to computationally inexpensive approximate quantum methods derived from pre-computed highly accurate quantum methods. The technology will allow us to address perhaps the biggest hurdle for quantum chemistry, which is that it just takes too long. Training with data generated by, for example, density functional theory allows highly accurate predictions of enthalpies, free energies, entropies, and electron correlation energies for significantly larger molecular sets than those originally used in the training. This ML correction algorithm results in quantum chemical accuracy at the speed of more classical methodologies that are much more widespread in the industry—in milliseconds instead of hours. This increased speed allows for quick predictions, but this in turn leads to a greater need to manage the data that is generated. This is where AiiDA, developed by Marzari and his team at THEOS, comes in. AiiDA, an automated interactive infrastructure and database built on the four “ADES” pillars of automation, data, environment and sharing, helps with data management, storage and retrieval, and ensuring that simulations are reproducible. In the end, AiiDA will allow the partners to build much more complicated, complex, but also modifiable algorithms to address some larger challenges in chemistry with more complex workflows. Finally, the ChemAlive team itself will focus on the overall commercial effort, but also on the front-end, looking at how they can harmonize the technology so that the customer is seeing a single source and can use it without needing to be able to code. We’ll actually be able to position quantum chemistry in a totally new way so that it can be used to do sales and marketing, for example. It will be so fast, users will be able to see results while making key decisions. The company aims for a SaaS one-button solution, an approach that will allow them to target non-specialists and therefore a much broader market. Jarowski reckons that there are probably between 800’000 and 1 million people in the chemical industry who would consider using such a technology and the majority of them are not PhD chemists. The speed, in conjunction with its presence on the cloud will bring quantum chemistry to a new audience of passive non-specialist users who just want reliable answers to fundamental chemistry questions. “By putting these technologies in a passive configuration we get access to that whole market rather than just the eggheads among them who would say “oh - I need a wave function for that,” he said. The grant will run for about 1.5 years and will allow the partners to employ the equivalent of two full-time employees to work on the project. Though the funding is extremely important, Jarowski says that work leading up to the application—notably sorting through intellectual property arrangements, which were helped along by Pascale Van Landuyt, NCCR MARVEL’s industrial liaison and tech transfer officer— was also very valuable to the company. The same is true for initial conversations with von Lilienfeld and Marzari, he said.